For use in wood, metal closet or cabinet doors. Adjustable tension, includes fasteners for quick and easy installation. For use in wood, metal closet or cabinet doors. Adjustable tension. Includes fasteners for quick and easy installation. 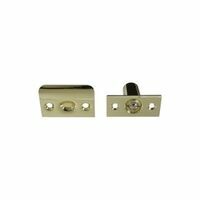 Diecast, plated bullet catch for use on interior closet doors and other utility doors. Used on french doors, single doors and cabinets. Adjustable ball for door gap and latching tension. Replaces existing door bolt and strike. Screw holes are countersunk for flush mount. Replaces existing door bolt and strike. 1" x 2-1/8" strike plate.